Art of the Carolingian period is darkly mystical, infused with an ethereal passionate intensity. Not until after the first churches were constructed and Christianity represented no longer a sect but the ruling state religion, could Christian art began to develop. The symbolic element, which had been borrowed from the ancient world, became less prominent, and the sacred personages of Christian art receive their fixed types. This development is represented in Manuscript Illumination. According to Medieval historian, Julia De Wolf Addison, "In these early works the whole tremendous power of the church is fully expressed. The heads and faces lack individuality, and are outlined and emphasized with hard, unsympathetic black lines; the colouring is sallow and the expression stolid. Any attempt at delineating emotion is grotesque, and grimacing. The beauty, for in spite of all these drawbacks there is great beauty"
Carolingian art centered around Manuscript Illumination, which thrived in Charlemagne's empire. After Christianity had spread throughout the length and breadth of the empire, the emperor created his own artistic institutions and his own system of patronage. Charlemagne desired to re-establish the art and cultural accomplishments of classical Rome. 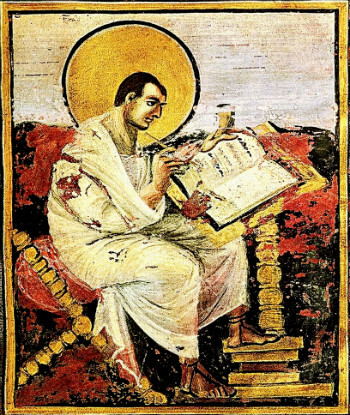 He supported numerous artistic and cultural endeavors, including monastic centers that were established to create and reproduce illuminated manuscripts. These early artists were Franks who had modeled their style after the works of Greek, Roman and Middle Eastern artists. They strove to capture the mysterious and mystical nature of early Christianity. The church made use of a wide range of art-works for spiritual comfort and instruction. Art Historian Clive Bell noted "Christian art preserved its primitive significance for more than half a millennium. Therein I see no marvel. Even ideas and emotions travelled slowly in those days. In one respect, at any rate, trains and steam-boats have fulfilled the predictions of their exploiters—they have made everything move faster: the mistake lies in being quite so positive that this is a blessing. In those dark ages things moved slowly; that is one reason why the new force had not spent itself in six hundred years. Another is that the revelation came to an age that was constantly breaking fresh ground. Always there was a virgin tract at hand to take the seed and raise a lusty crop. Between 500 and 1000 a.d. the population of Europe was fluid. Some new race was always catching the inspiration and feeling and expressing it with primitive sensibility and passion. The last to be infected was one of the finest; and in the eleventh century Norman power and French intelligence produced in the west of Europe a manifestation of the Christian ferment only a little inferior to that which five hundred years earlier had made glorious the East." The miniature painting of the Irish, Gallic, and German monks was a melding together of painting and calligraphy. From the scrolls and flourishes purely calligraphic human forms are constructed. The figures they painted are as severe as judges, and with pitiless dignity, they stare from the pages like threatening tables of law, demanding submission, fear, and obedience, but according neither mercy, comfort or redemption. for spiritual comfort and instruction.